“And also some of their fathers and their progeny and their brethren, We chose them, and We guided them to the Straight Path” [al-An’aam 6:87]. “And Allaah has preferred some of you above others in wealth and properties” [al-Nahl 16:71]. And when the Messiah ‘Eesaa ibn Maryam (peace be upon him) comes down at the end of time, he will come to rule in accordance with the sharee’ah (religious laws)of Muhammad (peace and blessings of Allaah be upon him), and he will follow him (peace and blessings of Allaah be upon him). “To each among you, We have prescribed a law and a clear way” [al-Maa’idah 5:48]. But the way (sharee’ah) of our Prophet Muhammad (peace and blessings of Allaah be upon him) is the most perfect, the best, the most complete and the most beloved to Allaah; it abrogates all laws that came before it. Undoubtedly the Prophets differ in status, and they are at varying levels. 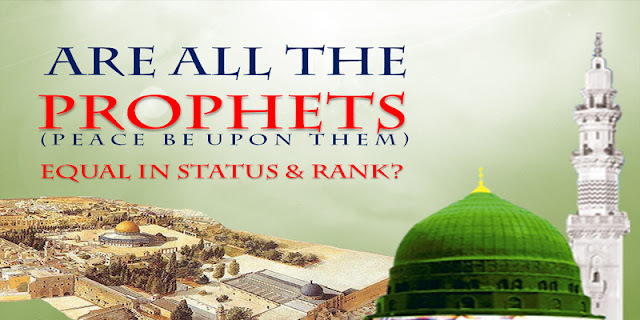 The best of them, as stated above, are the five Messengers of strong will (Uloo’l-‘Azm), and the best of them all is the Seal of the Prophets, Muhammad (peace and blessings of Allaah be upon him). With regard to the saheeh ahaadeeth (authentic prophetic narrations), “Do not prefer me over Yoonus ibn Mattaa” and “By the One Who chose Moosa over all of creation” – these all indicate the immense humility of the Prophet (peace and blessings of Allaah be upon him) when speaking of his brothers the Messengers. But he is undoubtedly the best of them all, for he led them in prayer in Bayt al-Maqdis (Jerusalem) on the night of the Israa’ (Night Journey). He will be the leader of the sons of Adam on the Day of Resurrection, and he is the only one among all the Messengers who will be granted the power of intercession on that Day. He (peace and blessings of Allaah be upon him) is the one who said: “From among the sons of Adam, Allaah chose Quraysh; from among Quraysh He chose Kinaanah; from among Kinaanah He chose Bani Haashim; and from among Bani Haashim He chose me.” He (peace and blessings of Allaah be upon him) is the Chosen One (al-Mustafaa) from among all of mankind.